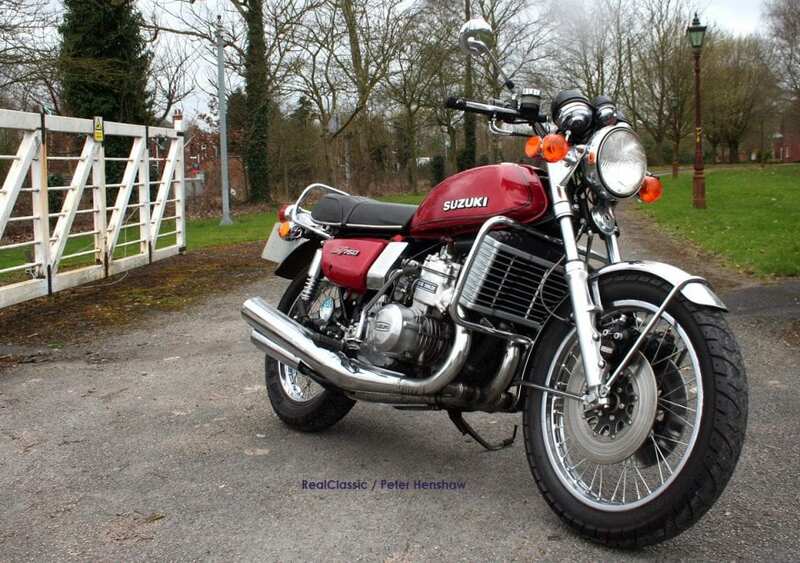 Now that it’s an acknowledged cult classic, this iconic 1970s water-cooled 750 triple doesn’t come cheap. But if you spend one single quid to enter the VMCC’s raffle, there’s a chance you could win this very bike. So what’s it like to ride? 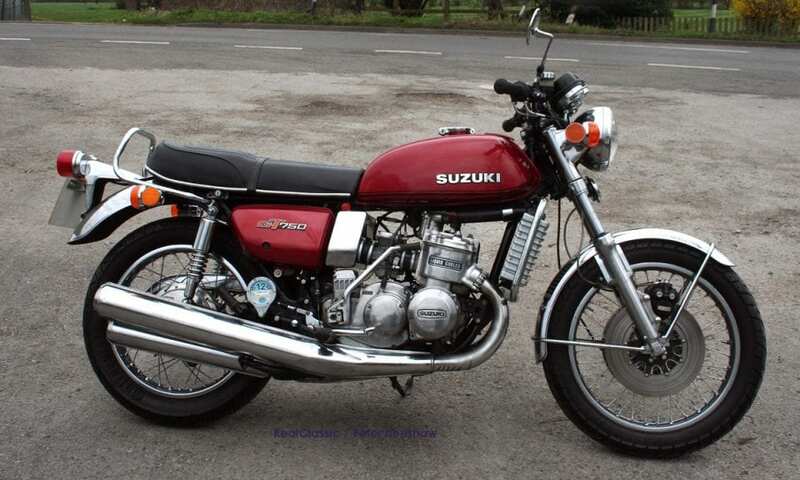 Remember the ‘Universal Japanese Motorcycle’, that faintly derogatory term from the 1970s and 80s? Its point was that all big Japanese bikes were essentially based on the same formula: across-the-frame air-cooled four-cylinder engine with chain-driven overhead cams, mated to a five-speed gearbox and housed in a thoroughly conventional tubular steel twin shock frame. 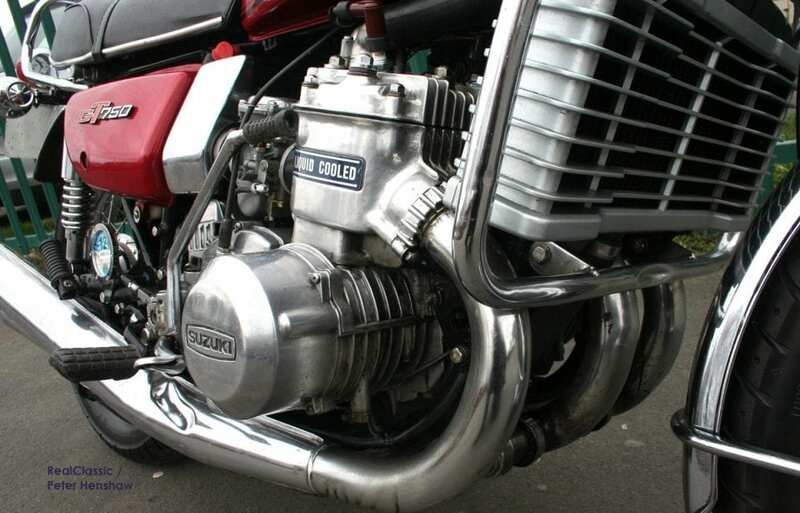 The Suzuki GT750 wasn’t one of those, at least, not in the engine room. Launched in 1971, it stemmed from an era when riders were offered a real variety show of ‘superbikes,’ as excited headlines of the time had them. Honda’s CB750 of course, was the first UJM, by then well established. If you wanted to kick start a big British twin, there was still the Commando 750 and Bonneville 650, plus the last of the BSAs. The Trident and Rocket 3 offered a four-stroke triple experience, while Kawasaki’s KH750 couldn’t have been more of a two-stroke. For those who hankered after a European bike, there were poles-apart V-twins from Ducati and Moto Guzzi, a Laverda parallel twin (with a triple on the stocks) or the BMW boxer. The truly eccentric might even opt for a Harley-Davidson FL or (from 1972) the Benelli Sei. 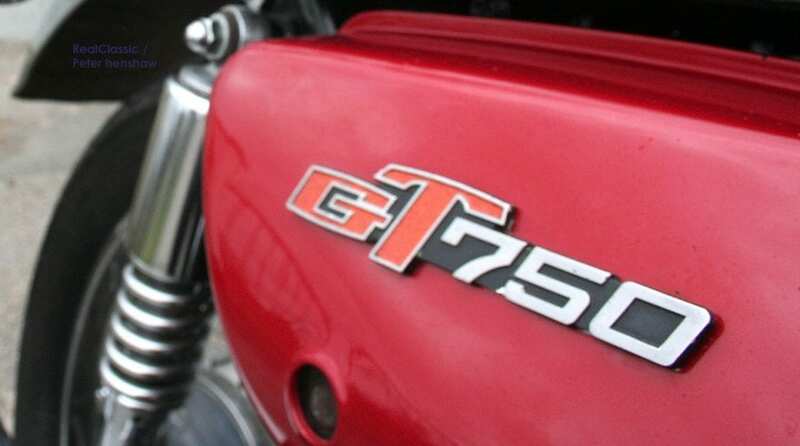 Not that the GT750 needed to be kept on the boil (ho, ho). Instead, the Suzi was clearly meant as a smooth and torquey tourer, a true two-stroke alternative to the more conventional opposition. It’s easy to forget that the original ‘GT’ really did stand for ‘Grand Tourer’, letters we now associated with the smaller air-cooled Suzukis not to mention a whole generation of hopped-up Escorts and Cortinas. But the 750 lived up to its letters. 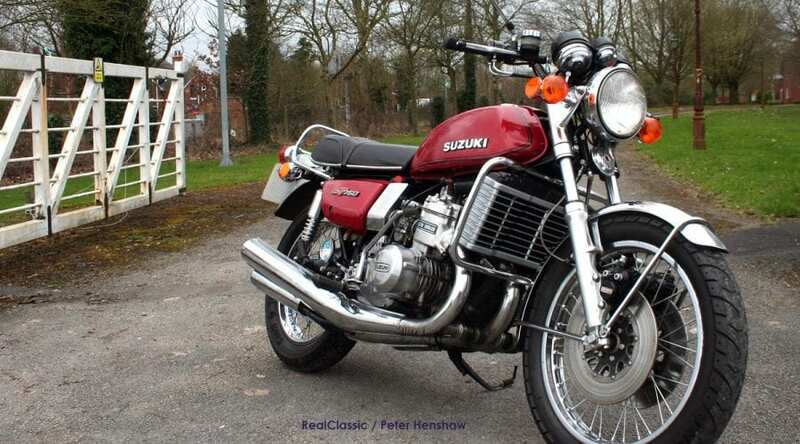 The three-cylinder engine might share a bore and stroke with the 500 twin Suzukis, but it was far less frenetic, tuned for torque rather than power – on a modest 6.7:1 compression, it offered 56lb/ft at 5500rpm, with a good spread across the range. 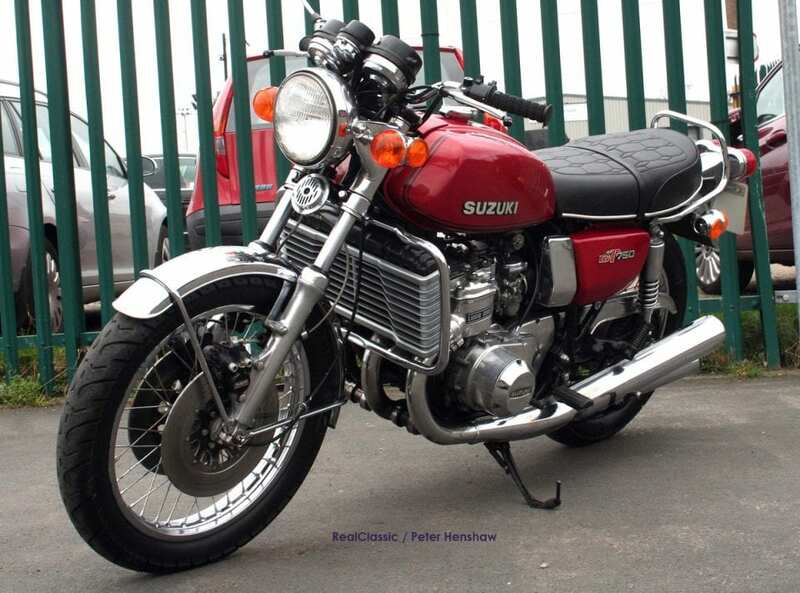 The GT750 was seen as a big bike back in 1971, but put it next to a modern 750 and it’s positively compact. At 507lb dry it’s certainly a heavy old beast, and took quite a bit of effort to haul the prize bike backwards out of the VMCC garage. But the seat’s relatively low and once on it’s moving the road the poundage drops away. I’d never ridden one of the big GTs before, so this would be a new experience. It fired up with a distinctive crackle and lots of smoke, which soon cleared as the triple warmed up. Out into the lunchtime traffic where the Suzuki proved surprisingly tractable in town, able to trundle along at 2500rpm and 40mph in fifth. It does suffer from the usual two-stroke lurching on the overrun. Twin front discs give reasonable stopping power (the first GTs had a front drum) but the rear drum is nice and controllable. Switchgear and instrumentation is exactly what you’d expect from a Japanese bike of this era, with the addition of a temperature gauge, which didn’t budge beyond ‘normal’ during my ride. Tractable in town, the motor is really happier at higher speeds, smoothing out as the revs rise. 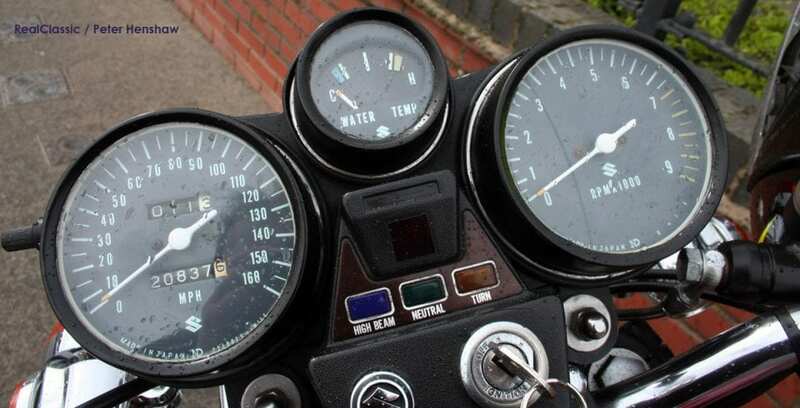 According to the red line, 7000rpm is on the cards, but on this 40 year old bike I didn’t venture beyond 5000rpm. There’s none of the peakiness or raw surges of power you expect of a Japanese two-stroke, not at the revs I used, just a steady surge of acceleration. In fact, the GT’s touring credentials soon became apparent. The seat is wide, comfy and supportive and the bars give a relaxed, in the breeze riding position. At 60mph, the two-stroke triple is waffling along at a smooth and unruffled 3750rpm. The crackly exhaust note seems at odds with all of this, but it’s there nonetheless. The featured bike is being raffled by the Vintage Motor Cycle Club.